The goal of this ticket is to write an egg hunter shellcode. An egg hunter is a piece of code that when is executed is looking for another piece of code (usually bigger) called the egg and it passes the execution to the egg. This technique is usually used when the space of executing shellcode is limited (the available space is less than the egg size) and it is possible to inject the egg in another memory location. Because the egg is injected in a non static memory location the egg must start with an egg tag in order to be recognized by the egg hunter. Maybe it will look odd but I will start by presenting the program that it will be used to test the egg hunter. The test program is a modified version of the shelcode.c used in the previous tickets. #define EGG_TAG "hex version of egg_tag; to be added later"
We start by defining the egg tag, the egg hunter and the egg; the egg is prefixed twice with the egg tag in order to be recognized by the egg hunter. The main program it will just pass the execution to the egg hunter that will search for the egg (which is somewhere in the memory space of the program) and then it will pass the execution to the egg. Usually the egg tag is eight bytes and the reason the egg tag repeats itself is because it allows the egg hunter to be more optimized for size so it can search for a single tag that has the same four byte values, one right after the other. This eight byte version of the egg tag tends to allow for enough uniqueness that it can be easily selected without running any high risk of a collision. Defining the egg tag is quite easy; finally it’s up to you to choose a rather unique word. In our case the egg tag is egg1. In order to be used by the egg hunter the tag must be transformed in HEX. I just crafted a small script: fromStringToAscii.sh that will transform the input from char to ASCII equivalent and then to HEX value. So in our case the egg tag value will be 0x31676765. What the egg hunter implementation should do, is firstly find the addressable space allocated to the host process( the process in which the egg hunter is embedded) then, search inside this addressable space for the egg and finally pass the execution to the egg. A much detailed explanation of how this egg hunter work can be found in the Safely Searching Process Virtual Address Space. All the source codes explained presented in this ticket can be found here: gitHub. In order to complete this task I will try to follow the workflow that I presented in my previous tickets concerning shellcode writing (Introduction to Linux shellcode writing, part 1 and part 2) meaning that i will first write a C version, then I will try to translate the C version in assembler trying to avoid the common shellcode writing pitfalls like null bytes problem and the addressing problem. This shellcode will also share most of his code with the shellcode from How to write a port-biding shellcode because it have a lot of functionalities and code in common. The first step in order to write the assembler version is to find the system calls number for each of the calls used in the C version. The second step is to take a look to the man pages of each of the functions used to check the needed parameters for each of the functions. Once we have all the necessary informations for the functions used in the C version (the system call numbers and the parameters) the next step is to write the assembler version of the C program. The assembler version of the shellcode is strongly inspired from the shellcode of How to write a port-biding shellcode, I just removed the functions that were not needed for the actual shell and added one missing function (the ConnectSocket function). To test the shelcode we will follow the procedure described in Introduction to Linux shellcode writing – Test your shellcode but basically we retrieve the HEX version of the shellcode (using the commandlinefu.com command) from the binary and then we added to shellcode.c program. Last point about these two parameters(IP address and port number); these parameters are pushed on the stack in HEX version and due to the Little Endian architecture of the Intel processors the parameters should be pushed in reverse order. For example if you want to push decimal 12345 (0x3039), you should push 54321 (0x3930). The goal of this ticket is to write a shellcode that will open a socket on a specific port and executes a shell when someone connects to the specific port. This is very brief and basic list of steps to follow if you want to write a shellcode under Linux operating system. The first step and by far the most important one is to find a vulnerability and to write the shellcode that’s exploiting the vulnerability. 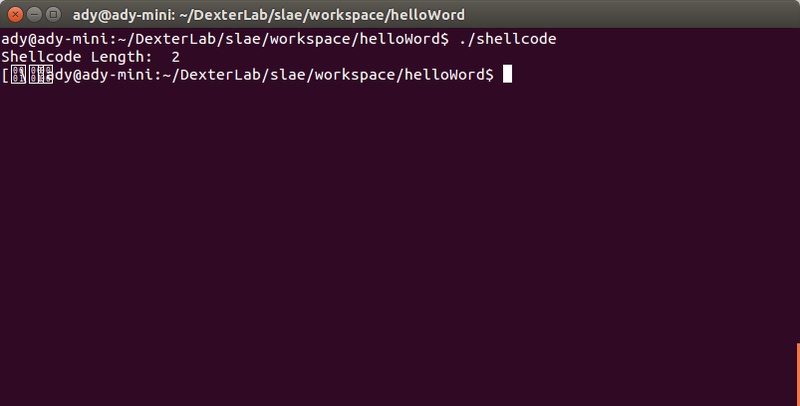 In this tutorial we will write a dummy shellcode represented by the “Hello World” program. The easiest way to write a shellcode is first to write it in the C language and then in order to have a more compact version, to translate it or to rewrite the shellcode in assembler. After the compilation (gcc -o hello hello.c) we can take a look at the generated assembly code (objdump -d ./hello -M intel) and we would see that for a very small C program the assembly version is quite long (this is mainly due to the C preprocessor); it’s 228 lines length ( objdump -d ./hello -M intel | wc -l). Now that we have the system calls it is possible to get some infos like the parameters needed by the each system call (using man) and the system calls numbers (all the system calls names and number are in /usr/include/i386-linux-gnu/asm/unistd_32.h file). Having all the needed information, we can write the assembler version of our dummy shellcode. In order to call system calls in assembler, you must fill the tax register with the system call number and fill the register ebx, ecx, edx for every parameter that the system call need. The above lines are simulating a vulnerable program by overwriting the return address of the main() function with the address of the shellcode, in order to execute the shellcode instructions upon exit from main(). Lets compute the HEX version of our dummy shellcode and then test it with our test program. As you can see the execution didn’t went very well for a number of reasons that will be explained in the second part of this small tutorial.